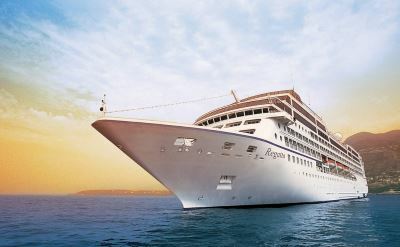 Oceania Cruises offers cruises from Los Angeles and San Francisco in California. The selection includes Australia, Japan and Panama Canal cruises. See the details below. 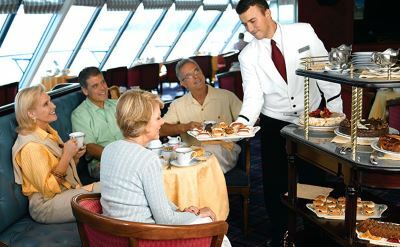 These all inclusive cruise ships offer fine cuisine, open seating restaurants, Culinary Discovery Tours and port-intensive itineraries. Oceania's 2-for-1 cruise fare includes dining at all specialty restaurants and unlimited soft drinks, bottled water, coffee, tea and juices. 10-day cruise to Alaska on Oceania Regatta. One-way from San Francisco to Vancouver (Canada). Visit Astoria (Oregon), Sitka (Alaska), Hubbard Glacier, Juneau (Alaska), Wrangell (Alaska) and Ketchikan (Alaska). 34-day cruise to Australia on Oceania Regatta. One-way from San Francisco to Sydney (Australia). Visit Honolulu (Hawaii), Kahului (Hawaii), Hilo (Hawaii), Nuku Hiva, Moorea, Tahiti, Bora Bora, Pago Pago, Apia, Fiji, Suva, Port Vila, Noumea and Brisbane (Australia). 7-day cruise to the California Coast on Oceania Sirena. Round-trip cruise from Los Angeles to Catalina Island (California), Ensenada (Mexico), San Francisco (California), Monterey (California) and Santa Barbara (California). 7-day cruise to the California Coast on Oceania Sirena. Round-trip cruise from Los Angeles to Santa Barbara (California), San Francisco (California), Monterey (California), Catalina Island (California) and Ensenada (Mexico). 16-day cruise to the South Pacific on Oceania Regatta. One-way from San Francisco to Tahiti. Visit Honolulu (Hawaii), Kahului (Hawaii), Hilo (Hawaii), Nuku Hiva and Moorea. 18-day Panama Canal cruise on Oceania Regatta. One-way from San Francisco to Miami (Florida). Visit Ensenada (Mexico), Cabo San Lucas (Mexico), Acapulco (Mexico), Acajutla (El Salvador), Corinto (Nicaragua), Puntarenas (Costa Rica), the Panama Canal, Colon (Panama), Cartagena (Colombia) and Havana (Cuba). 16-day Panama Canal cruise on Oceania Sirena. One-way cruise from Los Angeles to Miami (Florida). Visit Catalina Island (California), Cabo San Lucas (Mexico), Acapulco (Mexico), Puerto Quetzal (Guatemala), San Juan del Sur (Nicaragua), Puntarenas (Costa Rica), the Panama Canal, Cartagena (Colombia) and Grand Cayman (Cayman Islands). 162-day cruise around the world on Oceania Insignia. Round-trip from San Francisco to Santa Barbara (California), San Diego (California), Cabo San Lucas (Mexico), Ixtapa (Mexico), Acapulco (Mexico), Puerto Chiapas (Mexico), Puerto Quetzal (Guatemala), Acajutla (El Salvador), Manta (Ecuador), Salaverry (Peru), Callao (Peru), Pisco (Peru), Coquimbo (Chile), San Antonio (Chile), Puerto Montt (Chile), Punta Arenas (Chile), Ushuaia (Argentina), Port Stanley (Falkland Islands), Puerto Madryn (Argentina), Buenos Aires (Argentina), Montevideo (Uruguay), Punta Del Este (Uruguay), Rio Grande (Brazil), Sao Paulo (Brazil), Rio de Janeiro (Brazil), Recife (Brazil), Natal (Brazil), Fortaleza (Brazil), Mindelo (Cape Verde), Dakar (Senegal), Banjul (Gambia), Abidjan (Ivory Coast), Lome (Togo), Walvis Bay (Namibia), Cape Town (South Africa), Durban (South Africa), Maputo (Mozambique), Renunion Island, Mauritius, Male (Maldives), Kochi (India), Colombo (Sri Lanka), Rangoon (Myanmar), Phuket (Thailand), Penang (Malaysia), Port Klang (Malaysia), Singapore, Bangkok (Thailand), Sihanoukville (Cambodia), Saigon (Vietnam), Hue (Vietnam), Hanoi (Vietnam), Hong Kong (China), Xiamen (China), Shanghai (China), Tianjin (China), Jeju (South Korea), Busan (South Korea), Nagasaki (Japan), Kagoshima (Japan), Hiroshima (Japan), Kobe (Japan), Shimizu (Japan), Tokyo (Japan), Oarai (Japan), Aomori (Japan), Hakodate (Japan), Petropavlovsk (Russia), Dutch Harbor (Alaska), Kodiak (Alaska), Seward (Alaska), Juneau (Alaska), Sitka (Alaska), Ketchikan (Alaska), Victoria (Canada) and Astoria (Oregon).